Tall Fescue is a deep rooted, robust perennial grass. 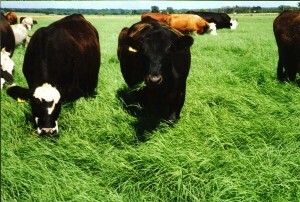 It is excellent for grazing purposes especially in a mix with ryegrass, chicory and clover. It can tolerate water logging, salinity heat and drought good. Do not allow tall fescue to rank as palatability declines markedly. To get best results maintain at a height of 15-20cm. Sowing rate: Sow in autumn and early spring at 25-32kg/ha with 4-6kg/ha clover and chicory. Production periods are autumn and spring. Makes good hay, silage and excellent forage. React better on N-fertiliser during Autumn and early Spring. Do not apply nitrogen in summer, only in autumn and early spring. Spring(Sep-Oct) Adapted to wide range of soil types, especially lands with waterlogged conditions.